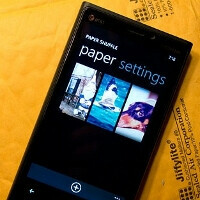 Tired of changing the lock screen wallpapers on your Windows Phone 8 device? 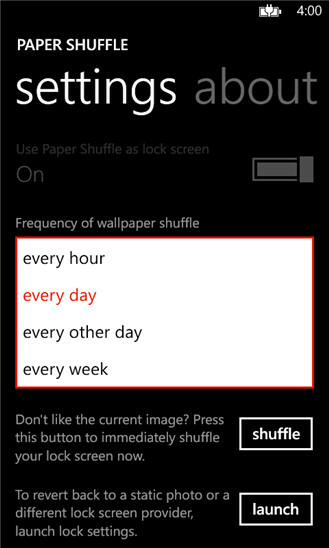 Bored by the once-a-day Bing picture? Here comes Paper Shuffle. For $0.99, the app lets you pick a set of photos in your gallery, and rotates them on your locked screen at predefined intervals, even hourly, if you are so inclined. The app autocenters the images for you, and we wish there was a manual option for that. It also doesn't let you select folders, but we hope these will be coming with subsequent updates. Indeed the developer says at their Reddit thread that local album picks are coming, as well as manual cropping and more rotate frequencies like 2, 6 and 12 hours. The update has been submitted, and should hit your handset in a few days. Now go load up on those "Beach Babes" sets. This comment has nothing to,do with this app, but let me know when they bring back whatsapp into the windows market. Whatsapp and Microsoft are handling this situation absolutely horribly. I mean who the hell removes an app from the market and then will decide to bring it back whenever its updated and whenever they so please. God forbid we have an app to use while you fix the piece of crap it originally was. welcome to the world of not owning a physical copy. At anytime regardless if you pay for it or want said product. The holder of said IP/distributor can do as they please by removing it from the market and removing it from your library.